Kirina has included a lot of great leather gear in her various posts, so here I just want to discuss my particular favorites. The Tanned Leather Jerkin may be considered the template for this chestpiece. It can be purchased at the leather armor vendors in capital cities. The Bristlebark Blouse is the same slightly darker shade of brown as the leggings, should that be prefered over the Tanned Leather Jerkin. 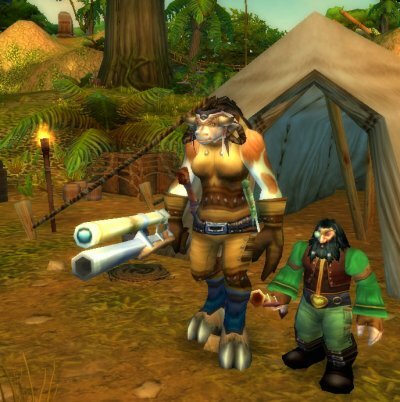 Other tan/brown options include the crafted Handstitched Leather Vest, the Lupine Vest, the gray quality Patched Leather Jerkin and Rawhide Tunic, and the Lionfur Armor and the Sleek Feathered Tunic (which drop off rare mobs in Mulgore, The Rake and Mazzranache, respectively). Leggings in the style of the Bristlebark Britches are also available to match the other colors of the jerkin. There are other pants in this style to consider: the Feral Leggings (red) or Tribal Pants/Primal Leggings (brown). 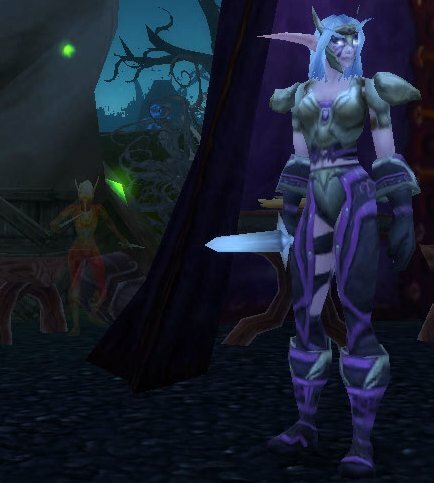 Horde can get the Black Leather Jerkin from questing in the Ghostlands. The Chest of the Wyrmcult rewarded from a quest in Blades Edge Mountains also shares this model. If you weren’t able to get the black version by questing, or chose one of the other quest rewards, merchants in all Alliance cities and Undercity for the Horde sell the Rough Leather Vest. 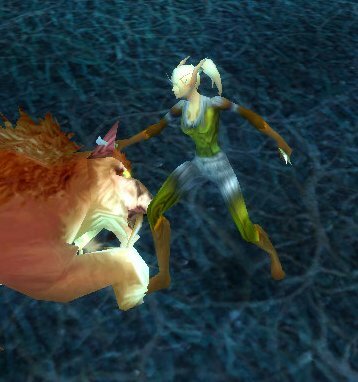 You could also hunt Bjarn, a level 12 rare mob bear in Dun Morogh, for the Black Bear Hide Vest. The Bandit Gloves and Bandit Boots could also be replaced for the Metalworking Gloves and the Recruit’s Boots, respectively. 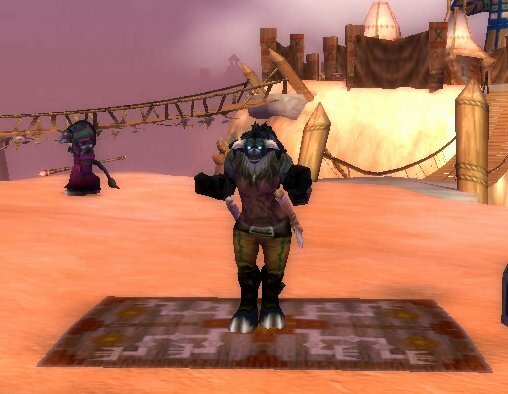 Just as the Horde can get a black leather jerkin from questing in the Ghostlands, so can the Alliance get a white leather jerkin from an Azuremyst Isle quest. This White Leather Jerkin itself is crafted. 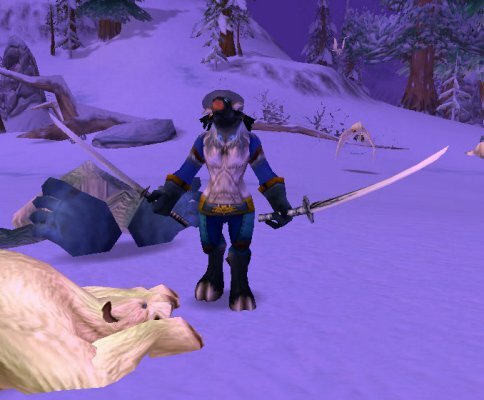 Other white leather jerkins are the Outland-level Boneshredder Jerkin, the Frostmane Leather Vest (drops off trolls in Dun Morogh), Kurken Hide Jerkin (Azuremyst Isle quest), or Snowhide Vest (Horde vendor in Borean Tundra). I really like the White Leather Jerkin for a more rugged take on an all-white outfit, or for a winter hunting look. The Thick Leather Pants are also another nice style of leather pants for casual wear; they come in green, brown, and red as well as blue. Look for the Dervish, Dokebi, or the Wolf Rider’s Leggings. 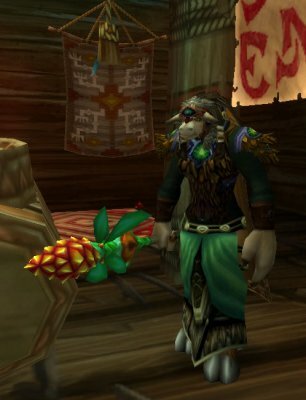 The green version, exemplified here with the Hunting Tunic and its matching Hunting Pants, has the fewest options — the Pathfinder Vest, Wrangler’s Wraps, or Brood Mother Carapace (drops from Mother Fang, a level 10 rare mob spider in Elwynn Forest). 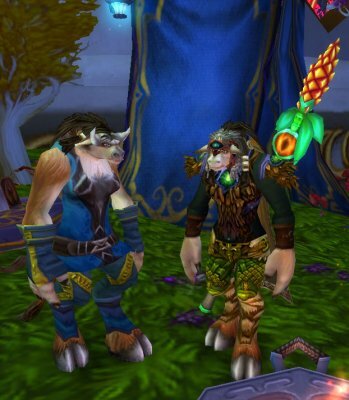 Another great leather set for casual, everyday wear comes from the Nesingwary Expedition quests in Stranglethorn Vale. Of my characters who are high enough level to have done these quests, I think I’ve only kept this gear on Ketura, since it as a hunter seemed RP-appropriate for her to do so. I like the smooth, simple look of these items. I know I’ve seen items with the same general appearance on the auction house, but I don’t recollect any particular set names at the moment. 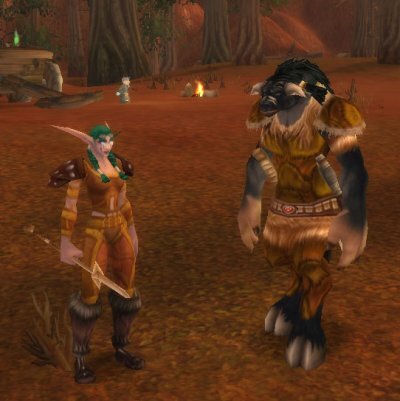 For a druid-like look — though I don’t feel quite up to assembling a “Top of the Class: Druid” article — you can’t go wrong with the brown-with-green-gem Ironfeather Shoulders and Ironfeather Breastplate. The leggings I really want to use with the Ironfeather breastplate and shoulders is the Giant-Friend Kilt, available from the Sons of Hodir at Revered reputation…. which, since Kerisa hasn’t done any quests in Storm Peaks at all, will take me a long, long time to get. So I’ve paired the Ironfeather breastplate and shoulders here with the Overcast Leggings (level 80 crafted PvP gear). With the black Sacred Feather Vest, you could use the crafted Leggings of Visceral Strikes. This handsome piece drops off of Shadowpriest Sezz’ziz in Zul’Farrak — but be warned, it took me 13 runs to get it! The weapon is the Conifer Cone Staff, another fabulous AH find. I’m particularly fond of the Lookout’s set for its unique lilac color. The Bonechewer Chestpiece and Ripleggings which drop in Outland match the lovely red-violet version of the Lookout’s set worn by NPC Ranger Lilatha. I see the Bonechewer Chestpiece on my server’s AH a lot more often than I see the pants, but a lookalike of the pants, the Ghostclaw Leggings, are available from Ghostlands questing. Kelisanna is wearing the Black Leather Vest in the above picture. This stylish version of the Warder’s top can be obtained from an Eversong Woods quest — however, this is the same quest that also awards the Guard’s Leggings cloth shorts, so if you are not a clothie you will have to decide which item you want most! The pants and other items she’s wearing in that picture come from the Sun-Cured Leather set, a highly eye-catching red version of the Lookout’s set available from a vendor on Sunstrider Isle. Once you’ve got the all the pieces of the Sun-Cured Leather Set in hand, stalk the Blood Elf Bandit on Azuremyst Isle for his Blood Elf Bandit Mask — and then you can be a Blood Elf Bandit, too!